A Lesson In Safety! Could have been worse. Llyod, I currently work in a radiology dept. of a hospital (as IT), and the radiologists always call me to come take a look when a pyro related injury shows up. I was surprised we only had one major injury over the 4th of July holiday period. One of the radiologists is also a member of my small group buy, so we get to talk about pyro every time he is on shift, heh. At the on set off this thread it sounded like he was ramming a bp motor.If by chance he gathered enough loose powder in the female part of the ram that it bottomed out on the guide pin, could the heavy compression of the hammer striking the ram have caused ignition. I don't know if this is possible or not. I'd rather take some ones word for it than to try a test myself. I't easier to ask. Edited by sitas, 08 February 2017 - 10:04 PM. 2) the operator should be inspecting the tool EVERY time before it's inserted in the mold. Lloyd , thank you for the come back. The very fact that it could be possible will make me approach things with more thought. As an older guy ,I can see where complacency creeps in . The old saying, familiarity breeds contempt," I crossed those tracks a million times and never seen a train ", Oh ya. FWIW, a relief hole just drilled it diametrically at the top of the bore helps a LOT, but one drilled at about a 45-degree angle from vertical (high on the outside of the rod, lowest where it intersects the bore) will do a lot more to keep the bore of the rod clean. With the angled hole (larger than the pintle bore), any powder forced up into the relief tends to remain loose, rather than being compacted. It then usually tends to just drop back out when the rod is removed from the mold. We pressed dozens of different tube-items at the shop, including some 'cored' devices, like what are being discussed. The angled hole allowed some of that to be automated with NO (zero!) failures due to the press-rod clogging-up. We had a very few damaged core pintles (but no explosions, thank goodness!) when we were using a diametral hole, which is why we changed to the angled one. Edited by lloyd, 09 February 2017 - 10:57 AM. 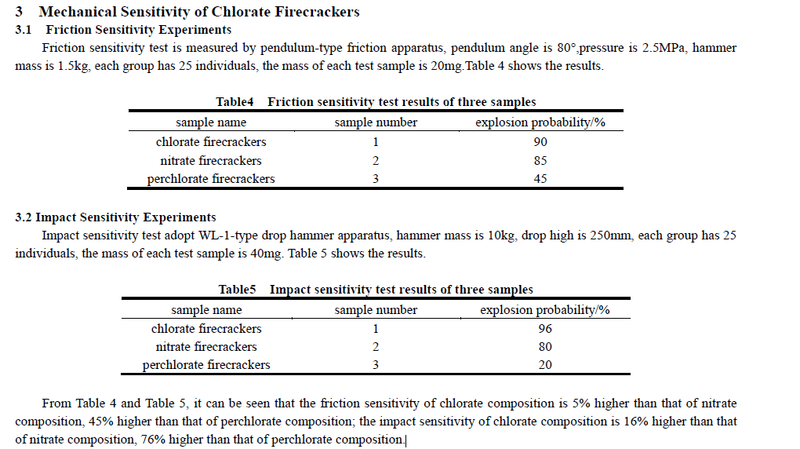 This taken from the "Safety Study of Chlorate Firecrackers" by QIAN Xinming1, ZANG Na1,2, FU Zhimin2 & JIANG Huiling2. It shows the relative impact and friction sensitivity of chlorate, nitrate and perchlorate firecracker mixes with aluminum and sulfur as fuels, ratios are 70 oxidizer, 20 Al, 10 S. You might be surprised...... !!!!!!!! Edited by Simoski, 28 May 2018 - 12:42 PM. I would suggest to anyone to read the source of that data, and use some critical thinking to determine how reliable you believe it to be before taking the results at face value. Good read, been experimenting a lot over the years, luckily nothing bad has happened to me thus far. You can never be to safe. I have to remind myself to slow down there is no hurry.